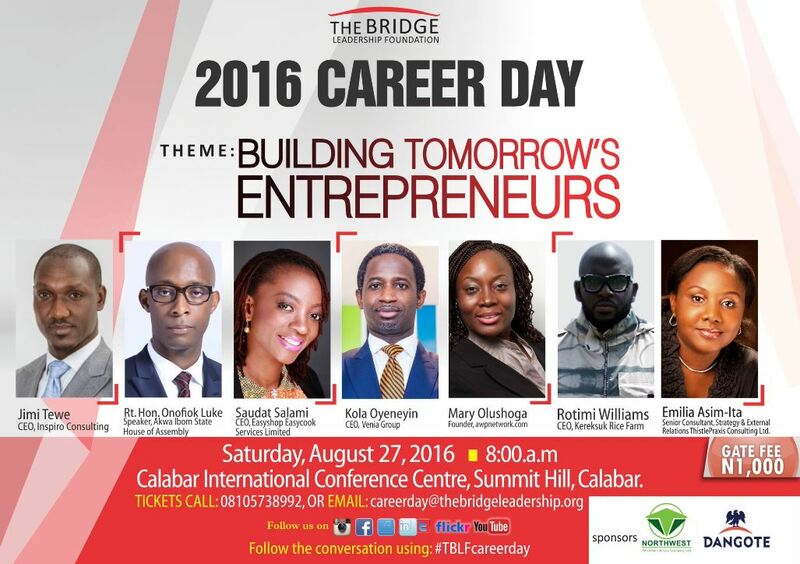 The Bridge Leadership Foundation is pleased to announce its 6th career day with the theme “Building Tomorrow’s Entrepreneurs’’ scheduled to hold on Saturday, August 27, 2016, by 8:00am at The Calabar International Conference Centre, Summit Hills, Calabar, Cross River State. This year’s theme seeks to stimulate the thinking among young people that entrepreneurship is not just starting and running a business, but rather involves a set of skills required to succeed. The theme also seeks to examine and provide insights through shared experiences challenging participants to consider new ways of pursing personal dreams in today’s economy using innovative approaches.